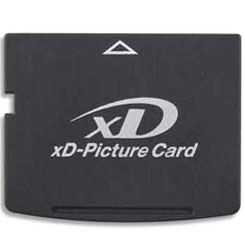 (EXtreme Digital Picture Card) A flash memory card used in digital cameras. Introduced in 2002 by Fuji and Olympus, the xD cards were the smallest on the market until the Mini SD card was announced in 2003. xD Cards provide high speed data transfer, use low power and became available in capacities up to 2GB. In order to accommodate the new format, Olympus introduced new cameras that accept xD Cards, CompactFlash and SmartMedia formats.